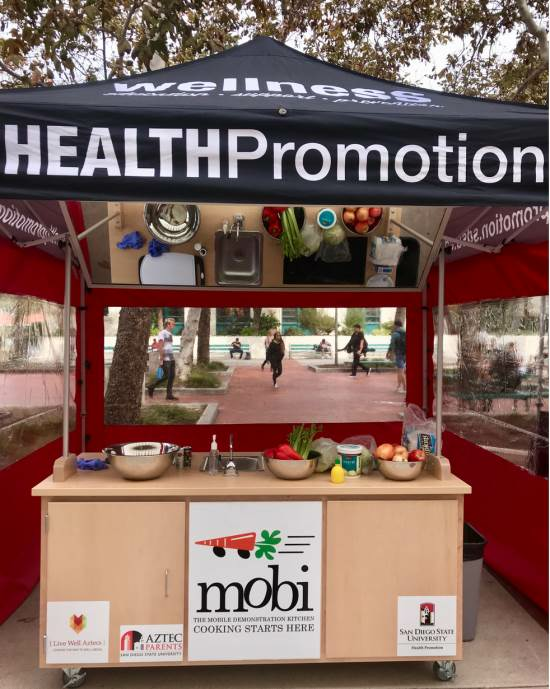 Health Promotion’s Mobile Demonstration Kitchen, better known as Mobi, is a brand-new resource for students on campus! Mobi provides nutrition education coupled with a cooking demonstration to teach students essential cooking techniques. Sick of ramen and eating on campus every day? Interested in improving your nutrition habits? Getting ready to move off the meal plan, but confused about how to grocery shop on a budget? Mobi to the rescue! Mobi, our brand-new resource for students, is a mobile kitchen where our Health Educators delivers nutrition education and cooking demonstrations in a concise, easy-to-follow format. Not only will you learn how to cook a new dish, but you’ll also get to sample the food and take home a recipe card! Mobi will be at the SDSU Farmer’s Market on the Campanile Walkway between Love Library and Hepner Hall. The Farmer’s Market takes place on Thursdays during fall and spring semesters. Mobi demonstrations will take place from approximately 11:30am to 12:30pm. We’ll see you there! Mobi is not limited to the Farmer’s Market! Student groups are encouraged to request Mobi demonstrations. Learn more about presentations and how to schedule one for your student group.